We’ve all heard at least one story on the news about brings home just how imperative it is to make sure parents and our children are following strict water safety guidelines. Summer weather has arrived, and that means finding activities that allow you to keep cool while having fun at the same time. Swimming is one of the best ways to thoroughly enjoy yourself outdoors in summertime – enabling you to enjoy the summer heat, get active and spend time with friends and family. Whether you spend time with your family in your own private pool, travel to a local public pool, or swim at a friend or family member’s house, you are sure to have a blast staying cool in the intense summer heat that comes with living in Dallas. Pool service professionals want to make sure that swimmers are safe as well as happy and entertained. This is especially poignant for those adults who will be in charge of young children in and around water this year. Teach your child(ren) how to swim – From infancy, children are able to learn how to swim. Naturally, they need careful guidance and observation so they are safe while learning. Talk to your local swim instruction center and enroll your child in swimming classes as early as possible. The better a child can swim, the lower his/her chance will be of drowning. Put up a fence – If your kids will be swimming at your private swimming pool, a safety fence should be installed from the first day your pool is installed. There are a wide variety of pool fencing options available that will meet your specific needs. Ask your local Dallas pool company about fencing in your pool with the goal of keeping children out of it when unattended. Never swim alone – This is a good rule for everyone to follow, regardless of age and swimming ability. Anything can happen around or in a swimming pool that may cause even the strongest swimmer to struggle in the water. Diving, jumping, slipping, tripping and accidental water inhalation can impair a child or adult’s ability to stay above the surface. Teach your children that they are simply prohibited from venturing near water without an adult companion. Utilize life preservers – Inflatable arm bands are not safety approved and will do little to protect a child from drowning. All children should wear properly-fitted life jackets that are approved by the Coast Guard until they are adolescents or older if they are weak swimmers or are physically or mentally impaired. Remember, drowning happens very quickly and often silently. Keep your children within an arm’s reach at all times if you are near a body of water or a swimming pool. Also worth noting is that infants and young toddlers are at risk in a shallow-filled bathtub. 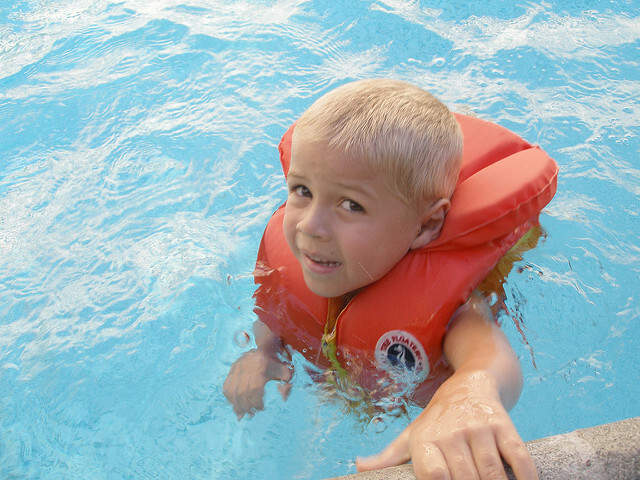 Drowning accidents are always preventable as long as water safety guidelines are consistently followed. How Can I Make my Pool More Eco-Friendly? Should I Fill in my Old Concrete Vinyl Liner Pool?